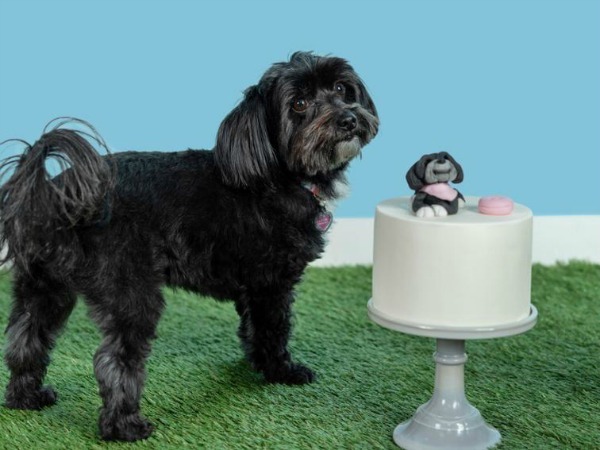 Yesterday, in our Easter Basket Dog Party Ideas list, we featured Puppy Cake Dog Cake Mix. This wheat-free cake mix for dogs makes it super easy to make pupcakes, birthday cakes for dogs and more. It’s a fun way to make any doggy celebration even more special. Ready to party? FOUR lucky winners will each receive a Prize Pack from Puppy Cake! 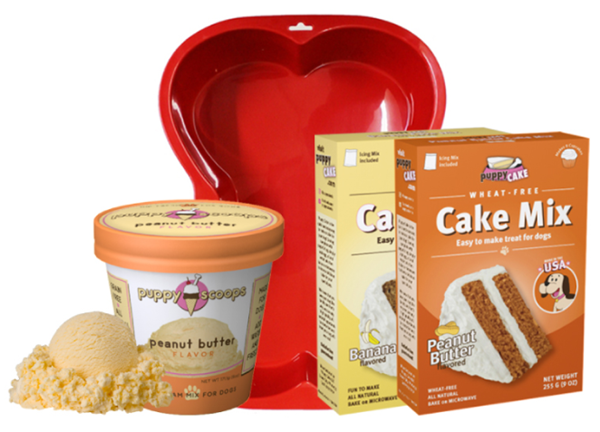 Each prize pack includes 2 boxes of Puppy Cake Mix, a Dog Bone Shaped Cake Pan, and a carton of Puppy Scoops Peanut Butter Ice Cream Mix for Dogs. Enter HERE to win 1 of 4 prize kits. Giveaway ends 4/7/19. Modern Dog Magazine is responsible for prize fulfillment. Everyone loves an underdog story. Sure, Meghan Markle was a successful woman and celebrity in her own right before marrying Prince Harry, but she always seemed ‘just like us’ to me. Because she’s so relatable, her story is like something out of a fairy tale. And now Meghan Markle’s dog Guy has published his own fairy tale! His Royal Dogness, Guy the Beagle: The Rebarkable True Story of Meghan Markle’s Rescue Dog has just been released in hardcover and we were super excited to get our paws on an early copy so that we could tell you all about it. Like all good fairy tales, Guy’s begins in the backwoods of Kentucky. He was lost and living alone until he met his forever owner at an adoption event; her name was Meghan Markle. They did everything together: went on walks, played fetch, and binge-watched Suits. Guy absolutely adored her, but he wasn’t the only one. A human loved Meghan, too; his name was Harry. Tall and debonair with hair the color of a traffic cone, Harry was also a prince. Guy soon finds himself in London, ecstatic about this new adventure. He works hard to fit in to the royal dog way of life, but he struggles. He has no fancy papers, no high-class education, and no command over the British puparazzi. As Meghan and Harry’s wedding day approaches, Guy feels as alone and desperate. But when the Queen gets into a bind when a royal tradition is nearly forgotten, Guy’s backwoods Kentucky skills might be able to save the day. With the Queen’s encouragement, Guy learns the true meaning of family—even if it’s a royal one. This is a cute, funny and heartwarming book for dog lovers of all ages, and makes the perfect holiday gift. Daisy is a rescue dog too, so Guy the Beagle’s story is especially touching. 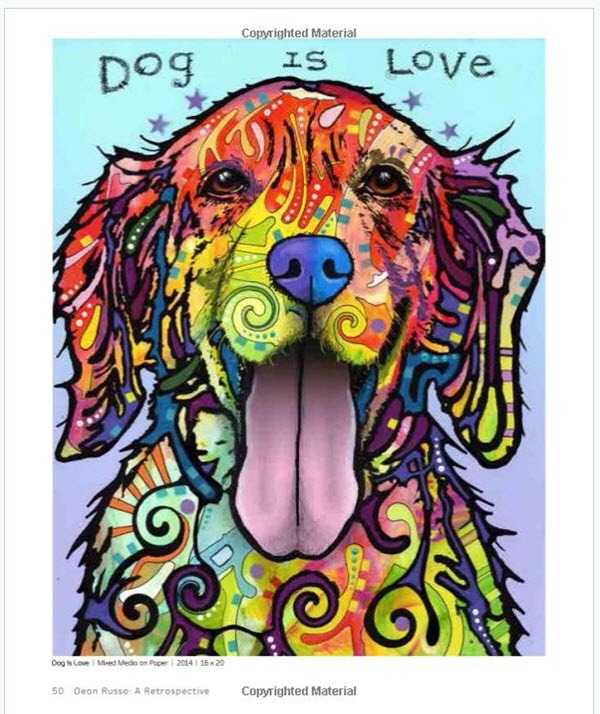 Snag a copy or two of Guy the Beagle’s book at Amazon and use promo code NOVBOOK18 to save $5.00 when you spend $20 or more on Books offered by Amazon.com by 12/1. Enter code NOVBOOK18 at checkout. Buy His Royal Dogness, Guy the Beagle: The Rebarkable True Story of Meghan Markle’s Rescue Dog. To celebrate the release of Guy the Rescue Beagle’s new book, we’ve got 4 copies to give away! Dog lovers, are you planning to stay in this weekend and cuddle with the fur kids instead of braving the post-Thanksgiving store sales and crowds? We are too! 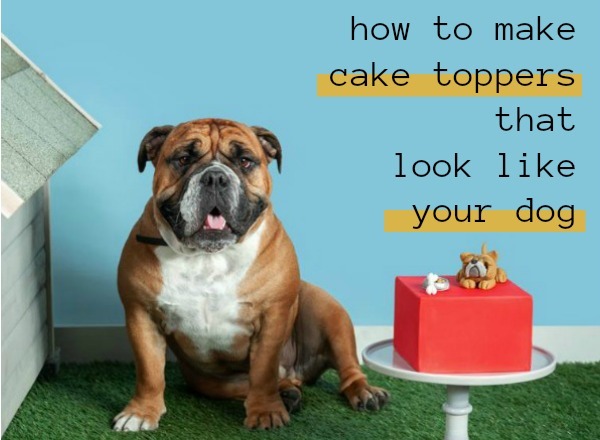 I was searching for a new dog-related DIY project I could start this weekend and found this super cute Dog Cake Toppers Lesson on Craftsy. 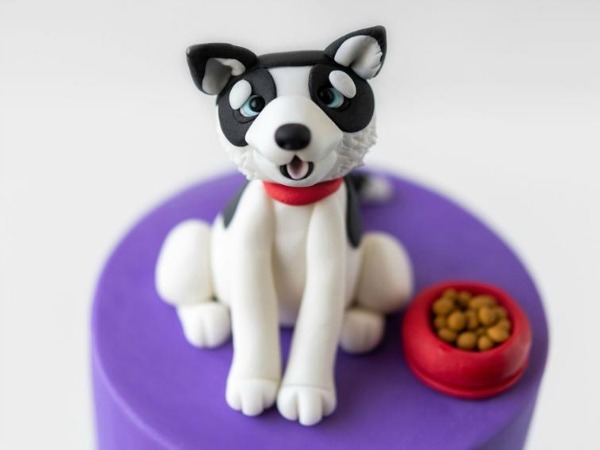 Bring your furry friends to life as adorable canine cake toppers! Whether they’re posing for a treat or adorning a cake, dogs bring a smile and sense of joy that’s always worth celebrating. 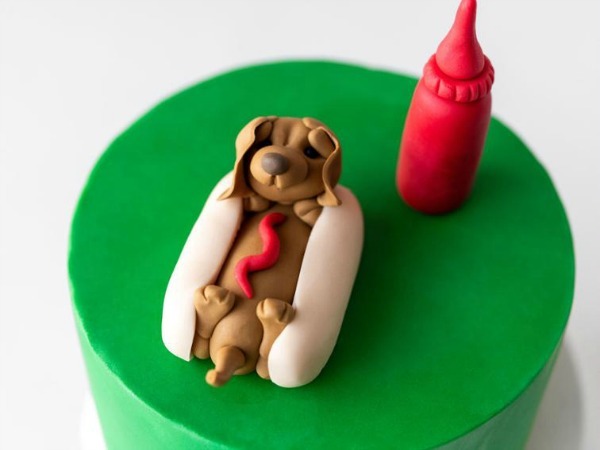 Join the award-winning “Cake Dutchess” and learn to make edible canine cake toppers along with some fun accessories such as bones, bandanas and more. Using basic shapes and easy-to-follow techniques, you’ll be able to recreate your favorite doggos for any occasion. I’ve done Craftsy’s online knitting classes before, and know how fun and easy to use their online craft classes are, so I’m excited about this new one. Every class comes with a 30-day money-back guarantee, so there is nothing to lose. In addition to a great weekend activity with kids, this craft lesson would also make a great gift for your favorite crafty dog lover. When you buy the course here for $9.99 you own it forever and can access it on any computer, tablet or smartphone with internet. You also get a FREE month of access to unlimited online classes from the whole library with categories including online photography lessons, paper craft classes, jewelry making, plus lots more great DIY projects. Visit their website here to check it all out. Now that you are on your way to making adorable cake toppers, be sure to enter our latest giveaway for the chance to win a KitchenAid Stand Mixer. 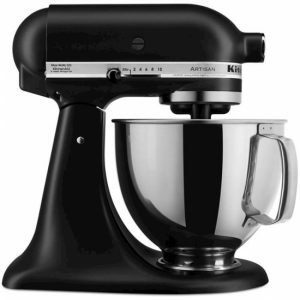 Quality kitchen tools and appliances make all the difference and this one is at the top of every baker’s holiday wish list! Use the Rafflecopter contest widget below to enter. Giveaway is open worldwide and ends 12/4/18 at 11:59pm ET. Winner outside of the United States will receive the cash equivalent of $250 via Paypal. Model and color may vary. Good Luck everybody! Animal lovers rejoice. There’s a new book release from artist Dean Russo. It’s a gorgeous retrospective spanning the artist’s entire career to date. From early cartoon character drawings to his iconic animal illustrations, this book makes the perfect gift idea and is certain to bring joy to everyone on your holiday gift list! For those not familiar, Dean Russo is a wildly popular Brooklyn-based artist with a unique graphic style. Inspired by his love of dogs and animals, he uses vibrant pop art colors and bold patterns to portray the energy and soul of his subjects. Mixed media artworks include pastels, pencils, oils, Sharpies, spray cans, liquid acrylics and more. The book, Dean Russo: A Retrospective, includes 200 amazing images, and is being officially released in hardcover on 11/13. It’s available for pre-order now at an amazing price, including Amazon’s pre-order price guarantee. Order now and if the Amazon price decreases between your order time and the end of the day of the release date, you’ll receive the lowest price. Also be sure to click the coupon on the book description page before adding it to your cart for an additional discount. 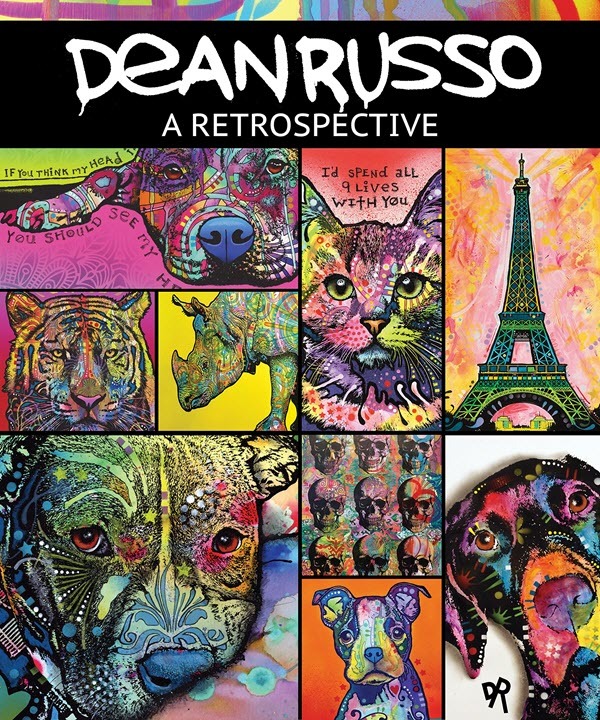 To celebrate the release of Dean Russo: A Retrospective, we’ve got 4 copies to give away! Use the Rafflecopter contest widget below to claim your entries. The giveaway is open to US residents and ends at 11:59ET on 11/13/18 so our winners will be among the first to get their paws on a copy. Good luck everybody! Hey dog lovers, looking for some new book ideas? We’ve got you covered with a bunch of Free Amazon Kindle Books about dogs and puppies! Every week, Amazon chooses some new and popular titles and makes them FREE to “buy” for $0.00 each. Click the links below to go straight to the dog book(s) you want. Since prices and promotions change frequently, be sure to double check that the price is still zero before completing your order. Once you get your books, they are added to your permanent library and you can access them any time. You can read the books on any wifi enabled device, smartphone, computer or tablet. And speaking of tablets, be sure to scroll down to enter our giveaway below. 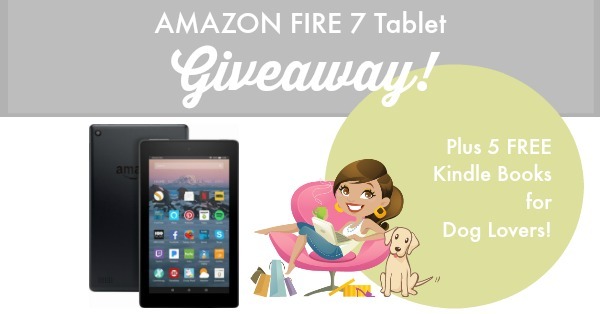 One lucky person will WIN an Amazon Fire 7 Tablet! Enter the Amazon Fire 7 Tablet Giveaway using the contest widget below. Giveaway is open worldwide and ends November 6th at 11:59pm ET. Good luck everybody!